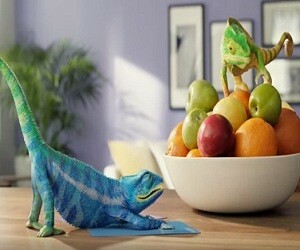 The latest Valspar commercial for zero VOC paint introduces Val, a color-loving chameleon that takes her clean living lifestyle to a new level with chameleon yoga – all inspired by Valspar’s full line of zero VOC interior paint, which helps her breathe easier. Now available at Lowe’s. All Valspar interior paints are zero VOC with the same great quality.